One of Ireland’s most innovative logistic companies is now working with the Port of Cardiff in a move that guarantees container services continue to operate from Wales and expands the southern UK gateways to Ireland. Cronus Logistics has engaged with Associated British Ports (ABP) and integrated Cardiff into its Irish Sea schedule, all part of its ambitious plans to strengthen its expansion of the southern UK to Ireland gateways. This new operation enables Cronus Logistics to offer new door-to-door services for all full load cargoes whilst specializing in the steel, forestry and building sectors between Warrenpoint, Dublin, Bristol and Cardiff. 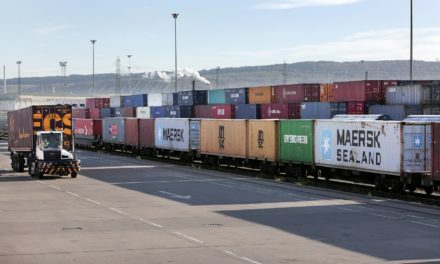 The 14-acre railhead at Cardiff provides a connected rail terminal linking directly into the national rail network opening up the whole of the UK and potential new markets. At Cardiff, full-length intermodal trains will now be discharged and loaded directly into the terminal. With an increase in rail traffic, Cardiff also has a large area of open and covered storage next to the railhead that can easily accommodate large shipments. Ralph Windeatt, Head of Commercial, ABP South Wales ABP, said: “This trade route is a vital link for our customers in South Wales, providing connections to suppliers and to important export markets. We’re pleased to welcome Cronus as a new operator for the route and hope that the additional capacity they will bring will allow more customers to benefit from the service and support economic growth and job creation in South Wales and beyond. We look forward to working with Cronus to provide a first-class service to users of the line via Cardiff.